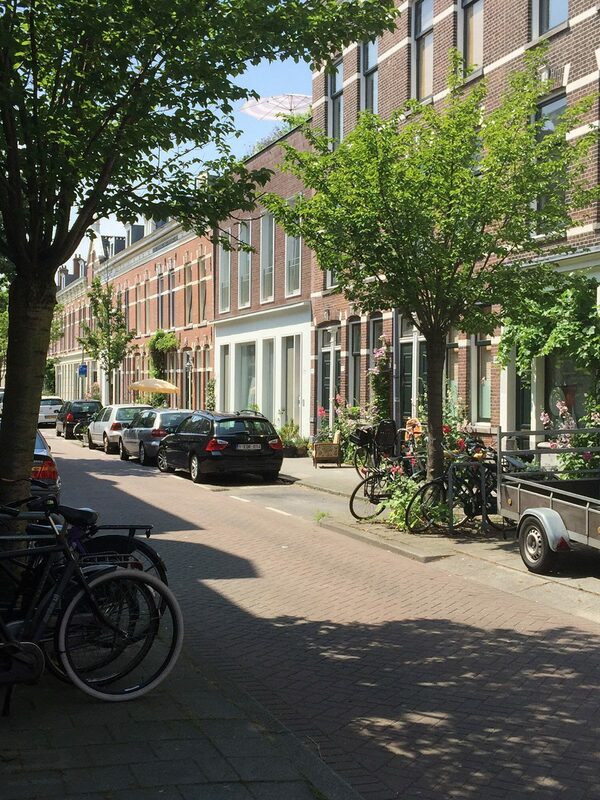 Only an alert observer would be likely to identify the terraced house of Rien Korteknie and Mechthild Stuhlmacher in the narrow pre-war street in Rotterdam West. There is a much greater chance, however, that he would notice only the lush vegetation covering half the building and not pay attention to the unobtrusive façade. The proportions of the brick façade and the vertical windows in white frames blend in seamlessly with the rest of the street. The plastered plinth with its large window openings resembles the many garages and workshop doors of its neighbours. Behind this façade, unexpectedly, we discover a wealth of space. Halfway inside the street-level storey, the floor drops down a few steps to reach the level of the garden. This is repeated on the floors above. An additional storey has been added at the rear, so that the bedrooms facing the garden are of a more modest character than the main living areas at the front. 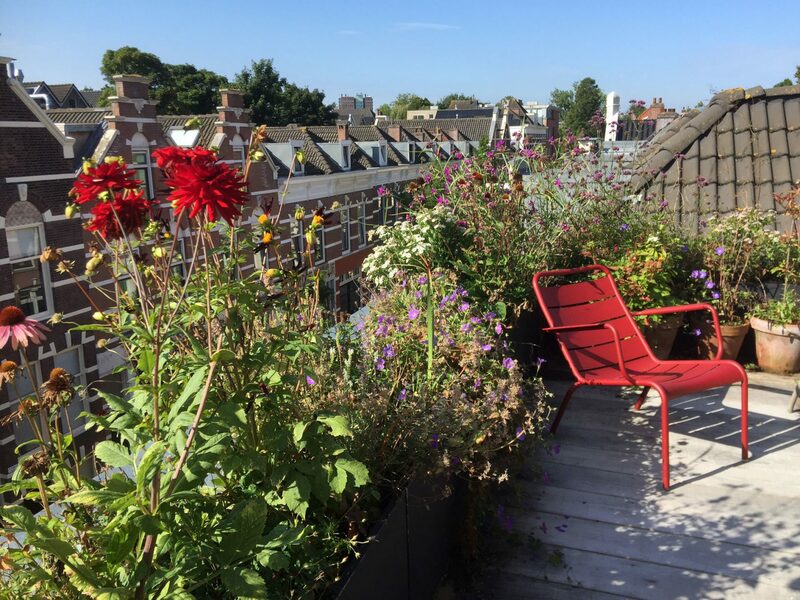 A surprise awaits on the top floor: the kitchen with large windows on either side, opening onto a terrace, with another large collection of beautiful plants. The house Rien and Mechthild built for themselves has never been finished. After moving in they have continued to work on it. The spatial dimensions of the house are set, but needs change, and so has the way the house is programmed. The ground floor was originally conceived as an office space, but it will now be turned into guest quarters. The considerations of the design process manifest themselves in the house. Except for the positioning of the stairs and utility spaces in relation to the load-bearing walls, there was no set idea of the house until construction started. No client would agree to work this way, but it has led to a more accurate understanding of building and inhabiting the house. Walking through the different rooms of the house and climbing its stairs, Mechthild talks about design and use. As in all their projects, Korteknie Stuhlmacher made use of the location’s particular features. Urban regulations limited the number of floors facing the street but not their maximum height, an opportunity to design spacious front rooms. The roof structure was changed at the last moment. Due to an objection by the next-door neighbours, the architects had to partially lower the roof. Although improvised it turned out to be a good move. The staircase ends under the lowered section. From here one overlooks the spacious kitchen or the adjoining roofscape. Some design decisions were made with a certain naïvety. For example, the rooms at the rear have large fixed windows with narrow operable shutters alongside – which makes it difficult to clean the glass from the inside. Rien admits that after the experience of building their own house, Korteknie Stuhlmacher have been designing and building differently. Control over the material and the conception of practical considerations have increased. In their clients’ houses, all the windows are easy to clean. The reason for my visit to Mechthild and Rien’s house is a conversation about the work of their practice. In the conversation, I attempt to uncover the irregularities in their ostensibly consistent work, in order to find out more about the nature and the motivations of their architecture. It’s a real challenge. Describing an architecture whose qualities derive from a precisely composed spatiality that is primarily experienced physically requires a specific language. The appeal of Korteknie Stuhlmacher's architecture lies in the effectiveness of the projects. Their buildings are not representations of something else or symbols of metaphysical thought; their architecture is the tangible reality of a reflection on the setting and human activity. This architecture requires an interpretation that analyses its precision, to reveal the projects’ riches and to understand the reasoning behind them. As a small deviation, the notion of welvoeglijkheid comes to my mind, an almost untranslatable Dutch expression that combines the notions of appropriateness, decency and suitability. To me, the word describes the way human action, art, or in this case architecture suits its purpose. Something is appropriate if existing relationships are respected and the intervention takes place in a precise way. For instance, a certain behaviour might seem generous, while in another situation the same act is seen as extravagance.1 The framework of what it means to act appropriately is only roughly defined, but within the given circumstances one needs to define what appropriate action actually means. By using the word ‘decorum’ the Swedish architect Johan Celsing places the notion of ‘appropriateness’ in the context of architecture. Celsing refers back to the Italian Renaissance architect Leon Battista Alberti and his teaching of the application of orders in, for example, a pallazzo or church. In Alberti's time, it was not appropriate to use a column typical of religious buildings for the design of a house. No architect would use Doric or Ionian columns today, but questions about decorum can provide more insight into such themes as integration into the landscape, the use of the budget or the design and structure of spaces. How does the architectural ambition compare to the total budget? Which part of the design fits in the landscape, and which part does not, cheekily trying something else? Searching for balance within such issues means searching for appropriateness. Celsing also argues that a trained eye judges not so much style or appearance but rather the approach of the design.2 An appropriate intervention goes beyond a question of taste and triggers a much more meaningful discussion about suitability of a project. 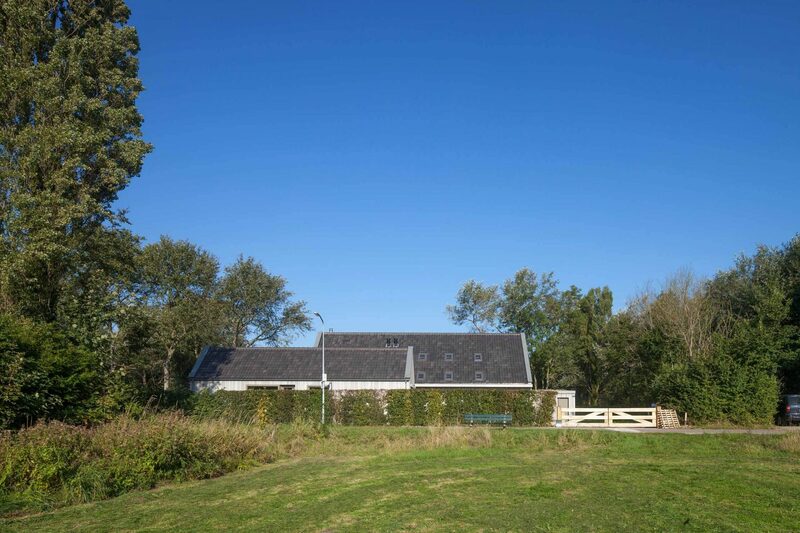 The spatial agenda of Korteknie Stuhlmacher Architects matured with the project De Kamers in Vathorst. The design for this public programme started in 2003; the building was completed in 2007. The context of the suburban ‘Vinex’ neighbourhood, where the surrounding house façades display ‘too much articulation’,3 forced the architects to design from the inside out. In their designs, Korteknie Stuhlmacher looked for a way of shaping the immaterial. The building is a composition of rooms – the primordial form of space, according to Mechthild. The individual proportions of the rooms are tailored to their function and desired atmosphere. Physical models and carefully drawn interior elevations determined the rules of the game. In the eyes of the architects the rooms are not voids consisting of separate surfaces touching at the edges, but enclosures in which the walls are continuous with floors and ceilings. A three-dimensional base folds upward to the height of the plinth or wainscoting and the ceiling forms a three-dimensional ‘hat’ with sides hanging down along the wall. Like a hairstyle gives character to a human face, the shape of the ceiling forms the room. The corners of the rooms are always solid, as all openings are placed in the walls. In addition, the architects use a clearly readable horizon to give scale to the rooms. This horizon is, for example, a line that occurs as a high plinth, or a line dictating the upper boundary of openings of doors and windows. Here too, the physiognomic equation remains relevant: the horizon compares to the line of the eyebrows, shoulders or waist, and gives a strict or soft, male or female appearance to the space. Articulated transitions connect the spaces with each other. The hall with its big void, for instance, unfolds into a cosy sitting pit belonging to the adjacent living room, and in another direction to the mezzanine of the dining room. At certain points the loose composition of rooms embraces the outside space and expels it in other places. The big windows seem to be inviting, showing the presence of the people inside as in many Dutch living rooms. 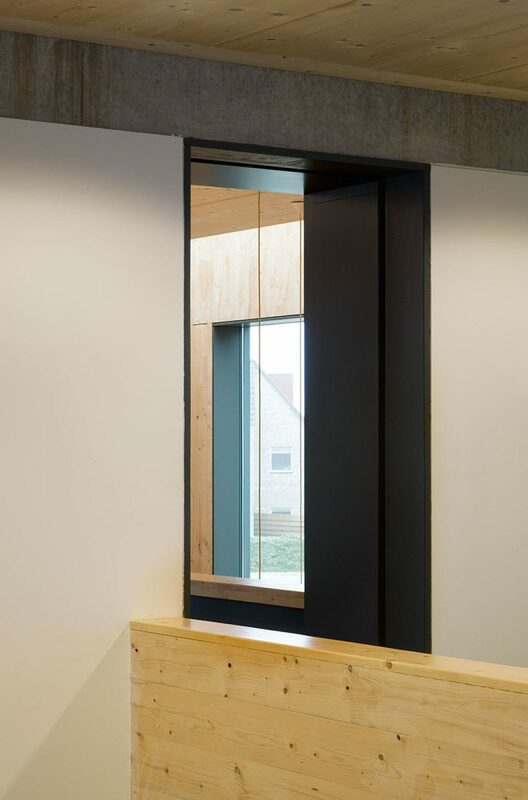 The remarkably large window frames are not unique to De Kamers project; they feature in almost all the practice’s projects. The robust sliding windows emphasize the spaciousness of the openings, bridging the thickness of the exterior wall. The weight of the window frame keeps the delicate timber architecture firmly on the ground. Even this desire for sturdiness relates to the human body. Both Mechthild and Rien are tall people; sturdily dimensioned details reflect the way the designers perceive the world. The architects developed relatively strict spatial rules for themselves, to be reinterpreted at every opportunity. A certain freedom, even frivolity, is sought in the sequence of different spatial relationships and roof shapes, if the context offers the opportunity to do so. The house in Uitdam is exemplary for this search for adequate spatiality. 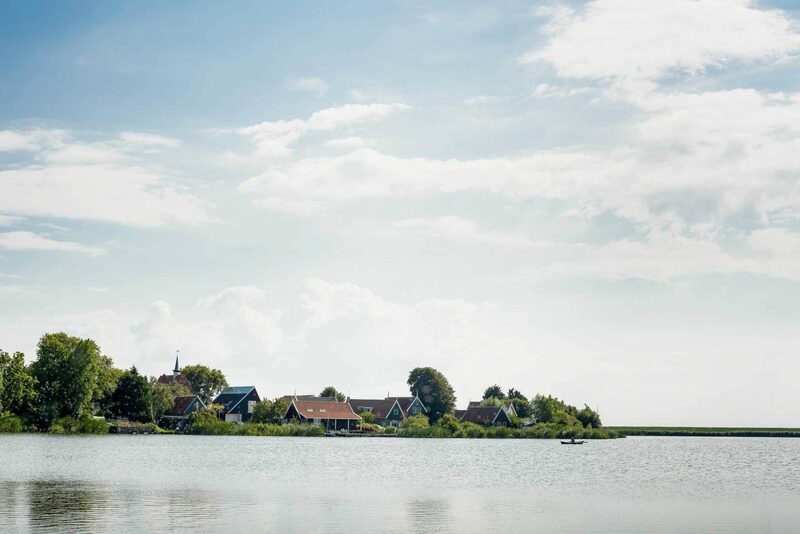 The house, built in 2013, is part of a classic Dutch setting: a ribbon village between a dike and a pond surrounded by reeds. With precision the architects placed the modest volume with a low gutter height and a steeply pitched roof on a small plot between existing houses. The dark timber facade with white accents fits seamlessly among the other wooden houses. The ground floor sits comfortably in the lee of the dike, leaning gently against the church. But one should not think that only the strict urban regulations have been met. The freedom in the design lies in the design of the roof. The tip of the roof rises and challenges the firmness of the dike. Upon entry, one immediately perceives the full height of the house; the light from the skylight falls all the way down to the entrance door. The roof unfolds above the bedroom and the study, and an incision in the ridge creates a roof light over the entire length of the building. The indirect light from above complements the direct light penetrating through the windows at eye level. The simplicity of the architectural means in combination with the frivolity of the spatial effect intensifies the experience of the architecture. The very basis for all projects is formed by the consistency and economy of means applied; at the same time every assignment requires a new approach and triggers new adventures. 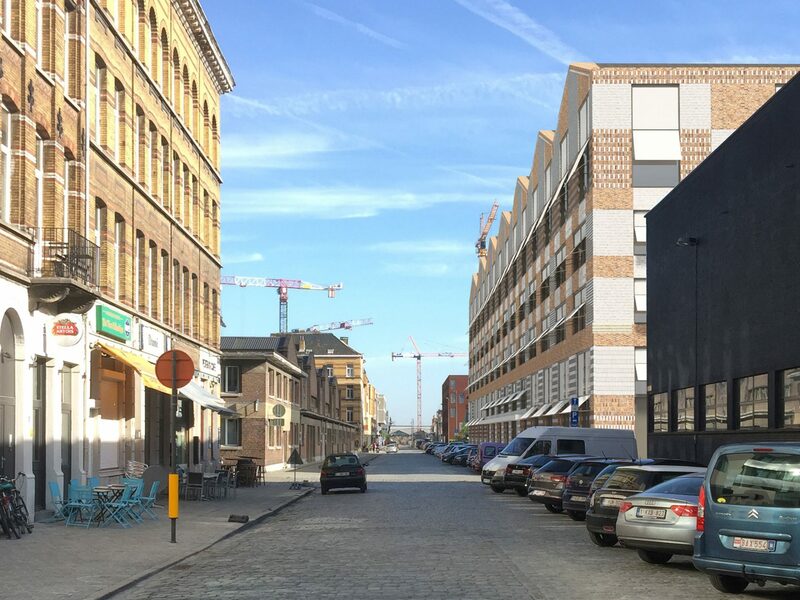 The projects for Campus Cadix in Antwerp and the A.J. Schreudersschool in Rotterdam show the development of an apparent schism. Whereas most of Korteknie Stuhlmacher's designs are composed with unambiguous architectural resources, ornament was added here. The design work on the project for the A.J. 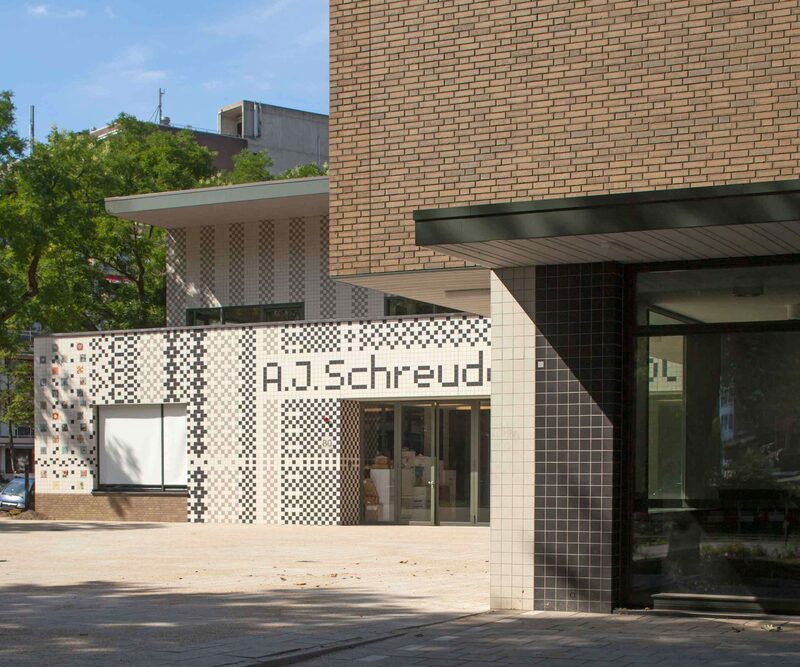 Schreuderschool started in 2008 and remained on the drawing board until 2013. The users are mentally impaired and autistic children, requiring an environment with few stimuli. The starting point for the design was the integration of the building in the post-war neighbourhood. The volume explains itself through the way it shapes both entrance-square and backyard. The square embraces its visitors, while the backyard is a shielded outdoor area where the children can play and get lessons in gardening. The wainscoting around the square initially appears in the design as a small aesthetic addition to enhance the spatial gesture of the urban configuration. The client asked for a cladding of robust tiles that could easily be replaced when damaged. But according to the architects the wainscoting soon began to take on a life of its own as outdoor wallpaper. The tiles provided a great opportunity to explore a variety of patterns. This resulted in a wild decoration, from stripes to duotone confetti. When the client, for very pragmatic reasons, asked that the rain pipes be placed on the outside of the façade the result, according to Rien and Mechthild, was a designing delight. The niches of the rain pipes were lined with tiles so that the wainscoting occasionally shoots up, exuberantly, all the way to the edge of the roof. At first glance, the decoration of the facade does not seem to fit in with the simple directness of the architecture of Korteknie Stuhlmacher. Despite its light-hearted character, however, this ornamentation proves functional. Beyond the client’s technical stipulations, the building communicates with residents and passers-by through its ornamentation. Neighbourhood residents talk about the school building with pride. The pupils contributed with handmade colourful mosaic tiles that were added to various parts of the pattern. Amidst the poorly maintained outdoor spaces and non-descript apartment blocks of the neighbourhood, the distinctive building forms a landmark. The school relates to its surroundings in an open and friendly manner, enhanced by the care that has been devoted to it. The value of the ornamentation, in this sense, goes beyond a purely aesthetic value, as it enriches the layered qualities of the building. The competition entry for Campus Cadix Antwerp was designed around the same period, in collaboration with HildundK. This large Munich-based office uses a distinctive decorative style. The extensive programme consisting of school buildings and apartments had to be incorporated in the former harbour area. Present on the site was a listed school building with courtyards and sheds, which were also listed. The architects carefully inserted new additions among the existing buildings. On the other side of the street came a new volume and dwellings. The shape of the new volume with its repetitive gables echoes the existing sheds. The new school, separated from the apartments by patios, defines the rhythm of the dwellings on the waterfront. When visiting the Plantin-Moretus Museum in Antwerp, Mechthild and Andreas Hild were charmed by the tile patterns of the floor. The floors are reminiscent of the motifs of Lutyens's Grovesnor Estate in London and inspired the façade of the Cadix project. 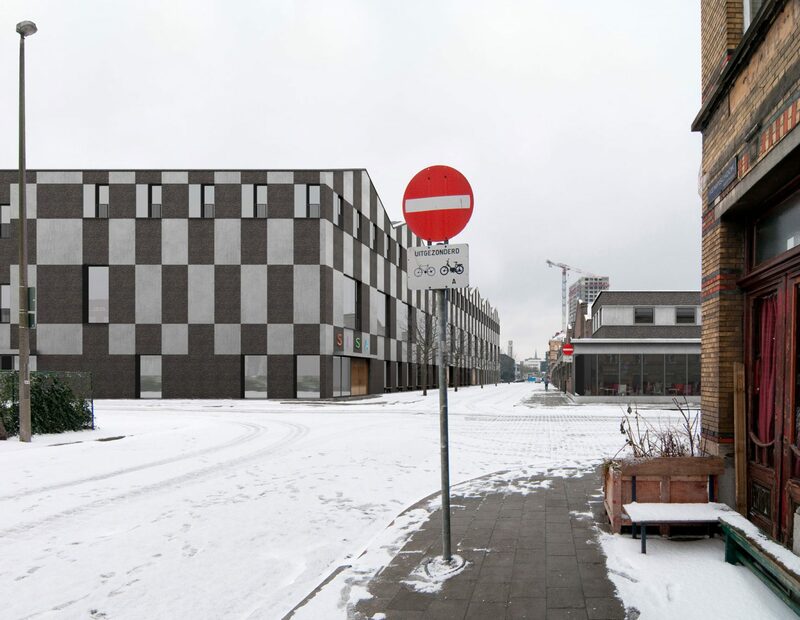 The new building was given a façade with a chessboard pattern. The façade pattern unifies the separate buildings. This bold choice of materials is more than just surface aesthetics; the pattern in the brickwork incorporates the necessary dilatations in the brickwork, usually despised by Hild. Due to the fact that different surfaces of bricks are placed side by side, in the decoration, the straight dilatation lines, which would be disturbing elsewhere, can naturally be integrated in the pattern. 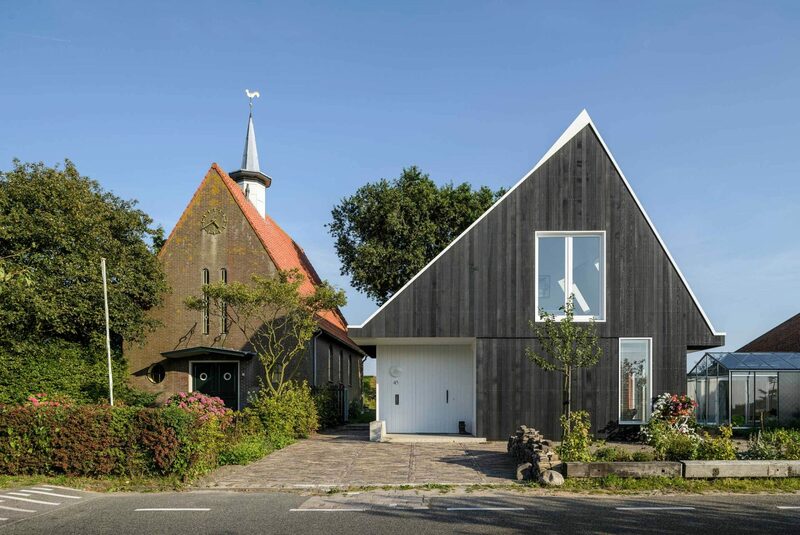 To understand how Korteknie Stuhlmacher combine their economical and direct use of materials with ornamentation, it helps to refer to the texts Mechthild wrote about HildundK's work, reflecting the thinking of Robert Venturi. The enrichment of the abstract modern architecture that Venturi advocated was an attempt to enter into a dialogue, from the architecture with its spectators. ‘In addition to readability and simplicity, we also need the Venturian call for ambiguity, his “yet” or “both and” (...).’5 This sentence precisely explains Korteknie Stuhlmacher’s choices for the ornamentation: the architecture simultaneously consists of clear, simple interventions and communicates through evocative chessboard patterns. Likewise, the ornamentation is always part of the architecture and is only applied if it enhances the spatial idea. Like HildundK, Mechthild refers to the concepts of the ‘world of objects’ and the ‘world of buildings’.6 According to Korteknie Stuhlmacher, an architect should focus on the design of spaces and not on the design of things. To regard a building as an object without concern for the spatial consequences means to impermissibly transgress the limits of the discipline. The series of buildings realised so far shows a continuous development that started with the first project, Parasite Las Palmas. This project forms the foundation of the search for directness and authenticity as a prerequisite for architecture. This edifice was planted on the roof of the Las Palmas warehouse in Rotterdam in 2001. 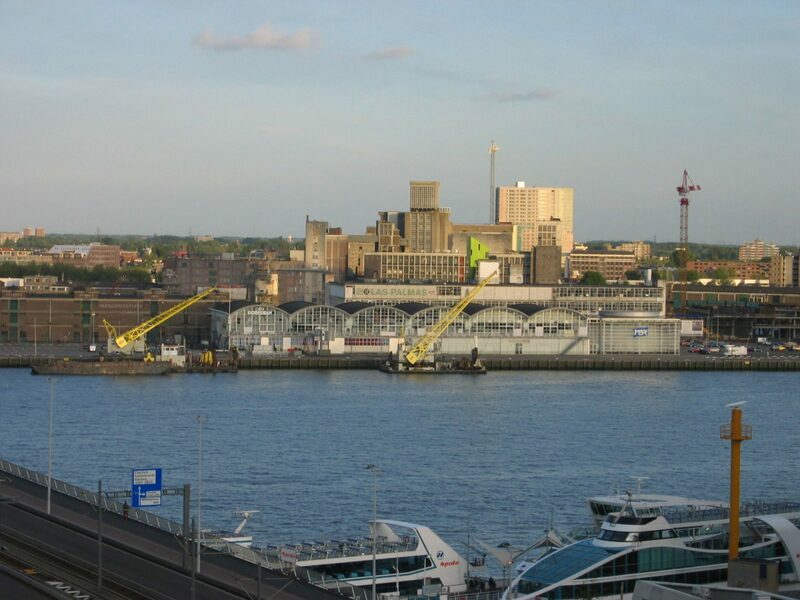 As an acid-green iconographic object in an otherwise grey port setting, the Parasite served as the billboard for exhibitions held in 2001 when Rotterdam was the European Capital of Culture. Dutch construction practice is famous for boldly iconic architecture, and the visitors understood the project primarily as a stylistic success. With the application of its solid wood construction, however, the edifice was also a criticism of the widely acclaimed Dutch architecture. The project was a lightweight commentary on the thin façade architecture that seemed to predominate, with hardly any relation between façades and interior. The unlined structure of Parasite Las Palmas demonstrated an alternative. Here, spatiality was created with structural means. The Parasite was constructed as an attic room, leaving the structure fully visible in the interior, both the surface and the cross section of the walls. For this project Mechthild and Rien acted as their own client: ‘for once, we were able to build and at the same time position ourselves without compromises’. A source of inspiration was Sigurd Lewerentz's flower kiosk at the cemetery in Malmö. As an editor and author, Mechthild Stuhlmacher was involved in the issue of OASE magazine on Essential Architecture in 1997, introducing the work of the Swedish architect to a Dutch audience. Lewerentz’s buildings achieve their intensity due to the coincidence of space and the materiality of their construction, without any lining or cladding. This inspired Korteknie Stuhlmacher to look for a material to achieve a similar consistency that would suit Dutch construction practice. 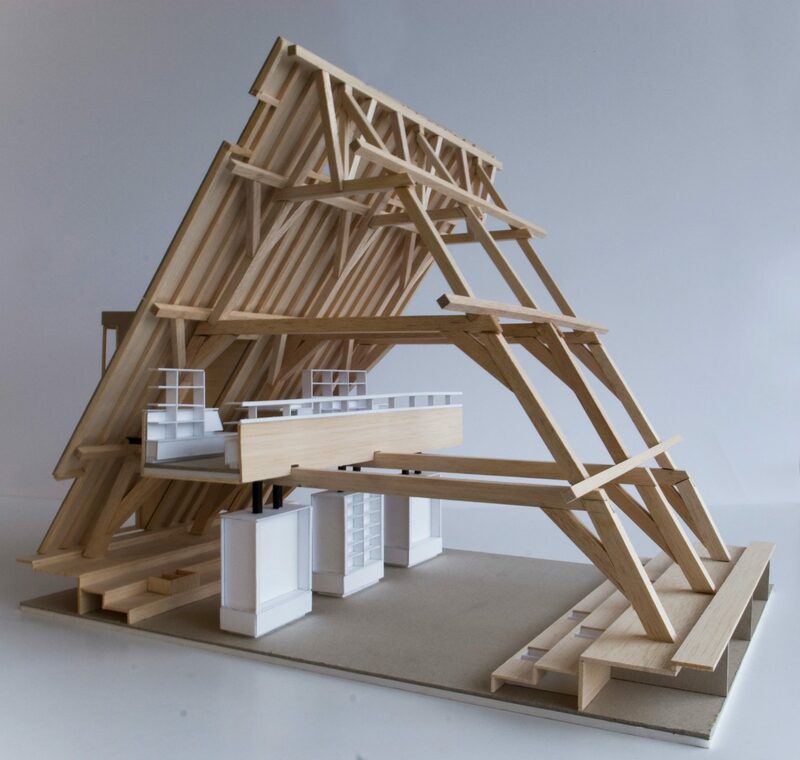 The application of Cross Laminated Timber (CLT) offered the opportunity to unite space and material, and at the same time it seemed to be a way of building sustainable and innovative architecture. The Parasite Las Palmas was a first experimental ode to Lewerentz. The light activism of Korteknie Stuhlmacher's projects developed into a clear understanding of the given design commission. The observation that Freinet Elementary Schools in Flanders mainly benefit from oversized spaces and a direct relationship to the outside is an astute one. The temporary barracks the school used before the competition in 2009 were not that bad after all: their open character and large spaces suited the free-spirited curriculum of the school well. 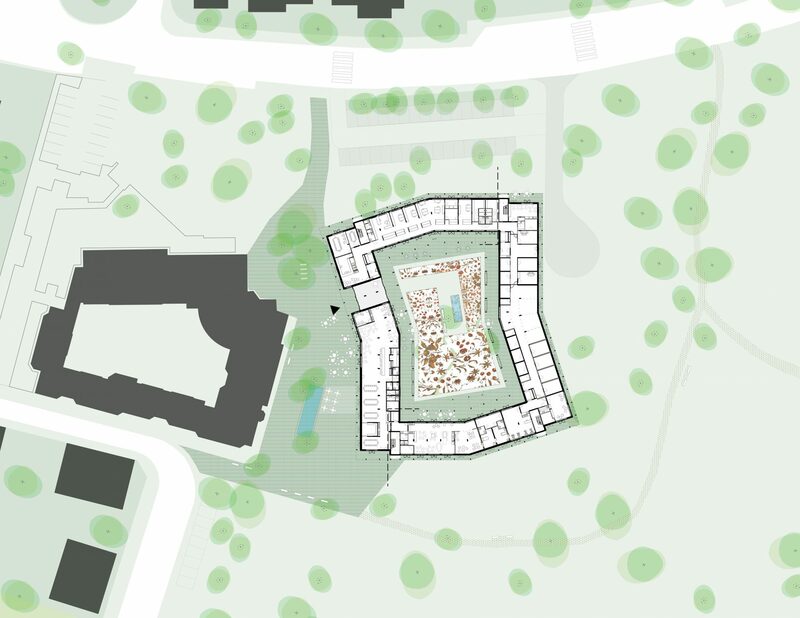 Korteknie Stuhlmacher proposed not positioning the new school on the street between the other buildings, instead retaining its existing remote place on the green plot within the large and green interior of the building block. 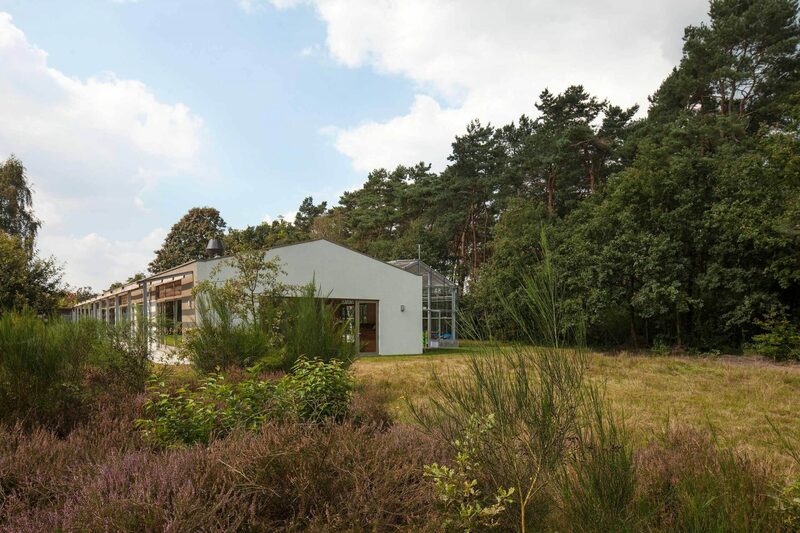 Within the restrictions of Belgian legislation limiting the surface of all public school-buildings, Korteknie Stuhlmacher looked for a way to maintain the essential qualities of the temporary structures, with oversized rooms and contact with nature. The hallways of the school were omitted to add extra space to the classrooms, which were directly accessed from the outside and connected to each other. Between the volumes for toilets and entrances sticking out of the volume, there was a veranda that could be used as an outdoor room. The interior felt like a wooden shed, while the exterior looked like a simple farmhouse, to stay within the given budget. With the equivalence of indoor and outdoor spaces, reference was made to Mechthild’s favourite school building, the Open Air School in Goirle from 1958 by the Dutch architect Bedaux. These ideas won the contest, but the tender procedure failed. 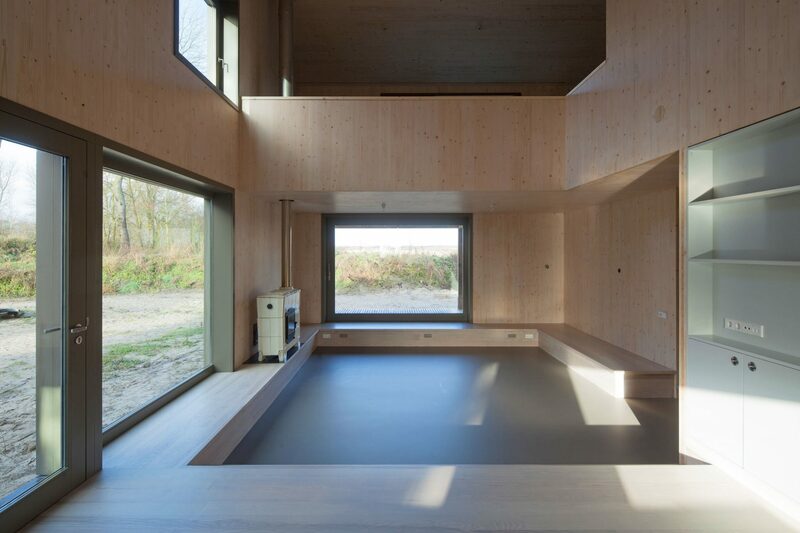 No contractor dared to build the design with a timber system that had not been previously used in Belgium. Korteknie Stuhlmacher quickly managed to come up with a new proposal that was cheaper without giving up on the desired qualities. The result was simple but no less powerful. Two pitched roofed volumes, one in glass and one in brick, are placed side by side in the meadow. The fully glazed greenhouse serves as hallway and outdoor room, giving access to spacious classrooms in the more enclosed part of the building. In these rural sheds, the children look out through large window openings on either side of the classrooms across the fields. The interior, with its uncovered ventilation pipes, is perhaps slightly less refined than other projects, but the daily use of the school will soon cover the somewhat coarse materialisation. 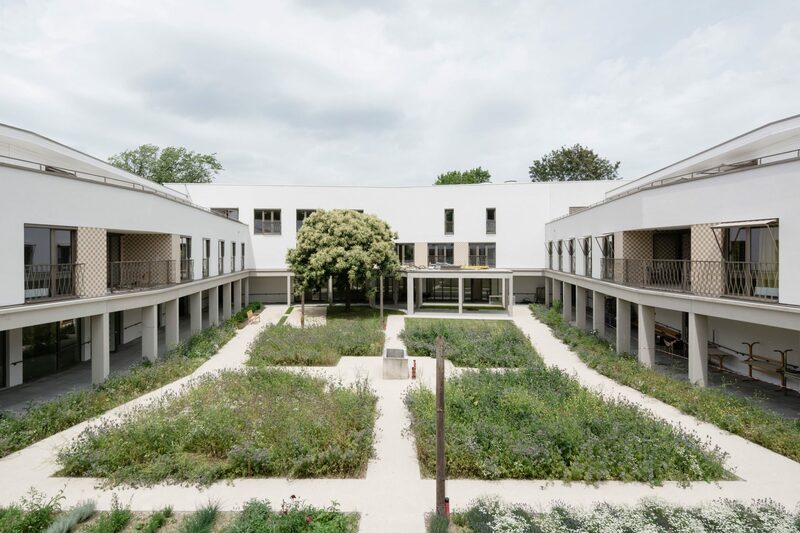 Light activism also determined the design of the new care home in Machelen, on the outskirts of Brussels. The project is a submission to an open call in 2011. The existing care home consisted of two buildings to be replaced by the new structure. Korteknie Stuhlmacher proposed keeping the more recent building on its site and to build a new building in the adjacent park. This new interpretation of the assignment offered multiple opportunities. The residents could stay in their homes during construction until the new apartments were ready. The building also strengthened the relationship between neighbourhood and park: by taking a step back, the building made way for a public passage to the park. As a new fragment in the fabric of the surrounding neighbourhood, the voluminous building at first did not seem to fit in. But the architects visually broke the length of the façade by denting and bending it, making the building look smaller than it actually is. Although a small part of the park needed to be sacrificed, the courtyard inside the building compensated for the lost suburban nature in a concentrated manner. The harmonious encounter of the building and the park gave specific importance to the design of the interior garden. The architects convinced the client to use the budget reserved for an artwork for the garden design. A therapy garden was created especially for residents suffering from dementia, referring to the suburban gardens in their everyday surroundings: a small farm with chicken, birds, flowers and vegetables. The clear statement in the assignment is characteristic of the work of Korteknie Stuhlmacher. Without being bombastic, the design proposals show how a job is answered better by not fulfilling the assignment in every area. This directness is a feature of the architecture that is closely linked to the personalities of Mechthild and Rien. Mechthild embraces Dutch pragmatism, after coming from Germany to study architecture in Delft. Even though Dutch culture is changing rapidly, Korteknie Stuhlmacher still captivate the directness and witty pragmatism of Dutch culture in their architecture and combine it with a more Central European sense of materials and quality. With the experience of a growing number of built projects, Korteknie Stuhlmacher used their architectural language more freely. New projects showed that the grammar did not need to be applied tightly. The architects worked on different kind of commissions. Rien gained important expertise about schools. For example, he was actively involved in the initiative to build ‘School Parasites’ – architectural provisional classrooms – in Rotterdam-South, and is a founding member of the Mrs Meijer Foundation, an organisation dedicated to researching and improving the quality of the architecture of educational buildings. Similarly, Mechthild's involvement in the Rotterdam Committee for Architecture and Monuments (Commissie voor Welstand en Monumenten) provided important insights about building in historical contexts and the approach to monumental buildings. The office used this accumulated knowledge to work on two very different transformation tasks with a public program. There was a romantic assignment to accommodate a library in a former monastery and there was a more pragmatic assignment for the transformation of an existing, bland school building into a new school. The approach to these projects could not be based on basic material choices, such as a CLT structure. The existing buildings extended their repertoire. The field of transformation does not necessarily offer opportunities to design buildings with a strong consistency of form, space, materialization and construction. Yet precisely through their specific experience, the architects were able to discover a certain freedom. 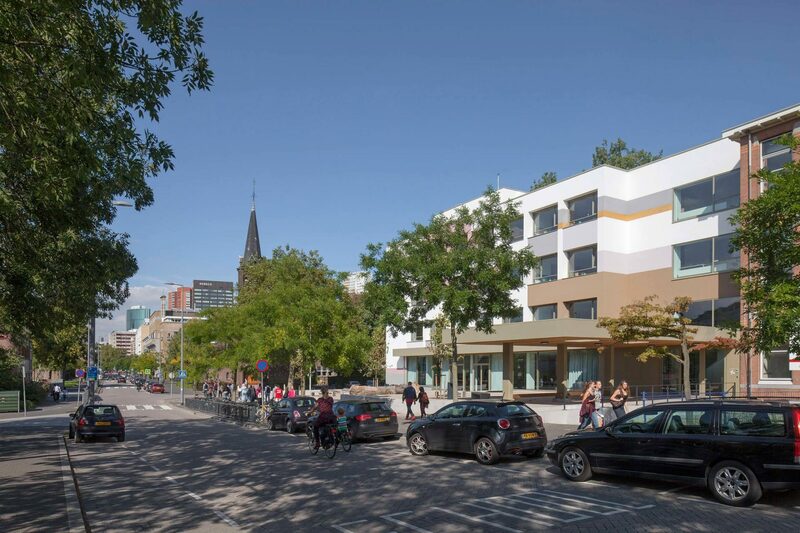 The project for the Hildernisseschool in the centre of Rotterdam was an extension of the primary school on the other side of the road. The existing building hardly resembled a school. The harsh, uninviting façade excluded visitors, withdrawing from public life. The architects stripped the building to its bare structure to reveal its functional potential. 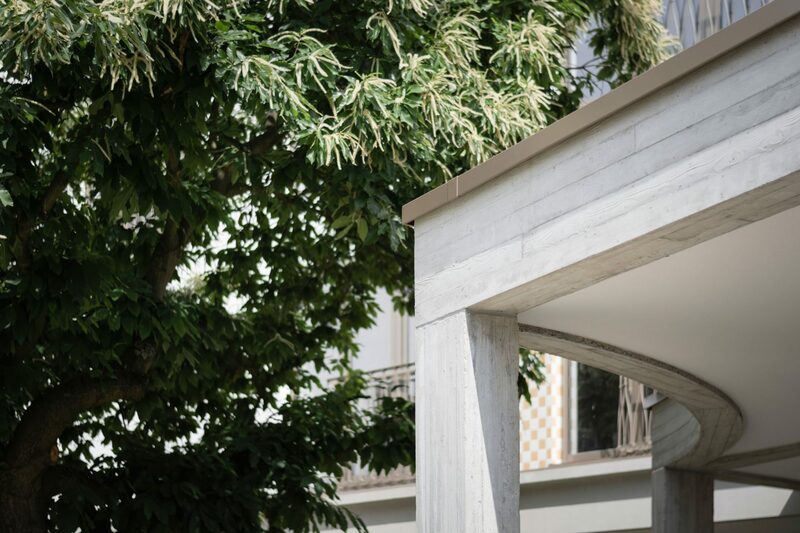 The key act of Korteknie Stuhlmacher was the opening of the building to the square in front and the addition of a large canopy covered with plants connecting the building to the street. A small extension on the side of the building softened the hardness of the surface. These interventions made the building suitable for its new use. The interior is composed of glass walls with solid frames separating the hallway from the classrooms. A first sacrifice had to be made: as the concrete ceiling did not provide sufficient space for installations and did not perform acoustically, a false ceiling was necessary. Rien advocated carefully chosen panels hung between the concrete beams, to leave the construction visible. New openings offer unexpected sights, from a room to the street, along the staircase and in the hallway. The surroundings are reflected in the colours on the facade. The plastered insulation consists of patches of leaf gold, grey-blue, moss green and brick red. Due to its ‘immaterial character’, plaster is not favoured by Korteknie Stuhlmacher, but in this case, the application was well thought out. The colour differences are emphasized by different grain sizes, increasing the depth of the façade. Mechthild notes that a transformation project does not significantly differ from building a new edifice. The designer needs to deal with structural requirements anyway, regardless of the specific material. Korteknie Stuhlmacher avoid wilfully designing the form of a structure, as the shape of an edifice follows its own laws. The structure is a powerful partner in the design of good spaces, including in renovations. This logic of design, both in new buildings and in renovation, is more powerful than the invention of a formal idea. According to the architects, the transformation project for the Dominican monastery in Mechelen, was a huge gift. The old monastery was dilapidated, but its spaces were magnificent. With its cloister garden, chapel and giant attic it offered plenty of space for its new function. The building had the serenity desired for the concentration of a library. The design team placed the main room of the library with the books in the attic. Only here did the architects need to intervene in the existing space with architectural means to accommodate their programme. Specifically designed cabinets divide the attic into circulation zones and study space; new dormer windows form intimate spaces for reading. The first floor is intended for concentrated studies and classrooms. The ground floor casually welcomes its visitors: here we find an exhibition space, an entrance hall, the cafe and informal reading areas. The decision to keep the church completely free from any programme or intervention is remarkable. The church becomes the agora of the library, a place for larger events like book fairs, lectures and performances. The architects carefully studied the nature of the existing building. As a next step they defined their own position in relation to the building. With very few structural alterations, the new function was assigned to the monastery. The roof was adorned with a number of large but modestly shaped dormer windows. The intensity of architecture lies in the interaction between the building and the intervention. The concentration of the interventions is increased by their small amount and simplicity. More than in new construction, transformation provoked architectural actions of an even greater simplicity, a simplicity that forms the very basis of the architecture of Korteknie Stuhlmacher. Back to the beginning. Each project determines the degree of modesty that is appropriate in the environment and suits the task. Perhaps the Buitenhuis Goeree Overflakkee project summarises Korteknie Stuhlmacher’s architectural ideas best. A quiet country road leads to a house that is shielded by a tall hedge. Behind this hedge two roofs are visible, the second one a bit higher than the first and slightly offset sidewise. The size of the volumes corresponds to the neighbouring houses; at first glance the building does not differ from its surroundings. Just past the fence, a view of the house slowly unfolds. The offset of the front house provides a rear wall for the entrance, leading to the large kitchen in the front house. 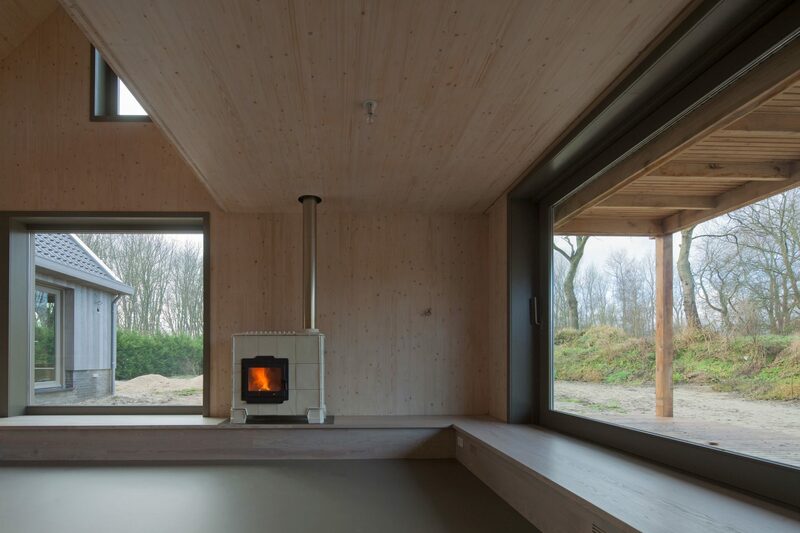 The adjacent living room has a lowered floor, just like the De Kamers project: the landscape outside is not merely looked at; the residents feel part of the landscape. And here too, heavy timber window frames define the views of the landscape. From the living room a long hallway leads to the bedrooms. This is repeated on the floor above. During high season this house, built of sober materials, which easily sleeps twenty people, is filled with voices and colours of the large family and their friends. The plans were developed as naturally as the house sits in its location. The spatial sensation derives from the composition of the spaces. Between the kitchen and the living room there is a platform offering a hesitant guest the opportunity to choose between the company at the table or the guests in the living room. The spatiality of the plateau is shaped by a void that simultaneously offers views from underneath to the roof. In addition to the spatiality of the house, playfulness has been sought in details. An orange-red section in the rear façade is a wink among the naturally grey timber of the walls. The rough timber veranda celebrates the contrast with the soft finish of the wooden inner walls. The position of a window frames the view to the neighbouring building with its similar proportions or unexpectedly allows for light from above. The natural appearance of the house makes it almost impossible to appreciate the power of the architecture. The house stands firmly on its site. Due to the frontal approach the building is fully visible from the street, yet it can easily be overlooked. This is not necessarily a problem, because Korteknie Stuhlmacher’s architecture does not seek to brag or shout. It does not draw attention to an external discourse, but to the private experience of the building. However, the meaning of this preliminary series should not be underestimated. The design of the buildings of Korteknie Stuhlmacher Architects is based on a strong architectural foundation that seeks playful exceptions for every new task. Only courageous architects are able to concentrate on the essence beyond their willfulness.